Portuguese death records are called “obitos”. For most years, those obitos will be found in church records. If you’ve worked with the records of the 1800s, you know that most obitos offer very little information. They give the name of the deceased, the date of death, their age at death, what parish they were a part of, the name of their spouse or their parents if they were unmarried. Sometimes it tells you where they were buried. Beyond that, you are on your own. The scant information can make it difficult to determine if you have the right person. I came across this obito for 7 May 1802, which provided more details than I could have imagined. This distant cousin was not wealthy, but died as a newborn. My Achada relatives were Catholic and very serious about it. A newborn that was not going to survive needed to be baptized–and fast. The family would have feared for the baby’s soul and for an eternity spent in Limbo. This meant that someone who attended the birth would perform the baptismal. Usually that was the midwife. In this case, it was a relative, who happens to be my ancestor. 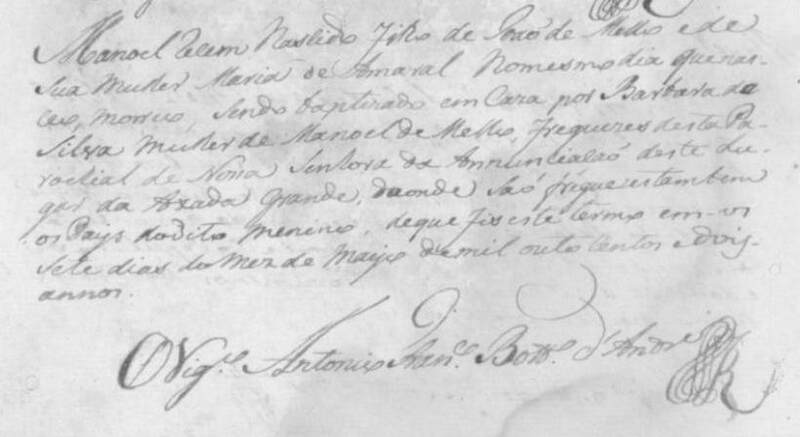 The obitos starts Manoel recem nascido which means that he was a newborn. He was the son of (filho de) Joao de Mello and Maria Amaral. The woman who performed the baptismal (sendo baptizado) is Barbara da Silva who is the wife (mulher) of Manoel de Mello. Barbara and Manoel are my 4th great grandparents. Joao de Mello and Manoel de Mello were brothers. They were the children of Estevao Correia and Anna de Mello. Barbara da Silva was Joao’s sister-in-law. It does not mention a midwife, so I have to wonder if Barbara was a midwife, or attended the birth in that capacity and delivered the baby. It is sad that this newborn child died. But, were it not for that fact, this would have told me he was the son of Joao de Mello and Maria Amaral and nothing more. It might have been difficult for me to sort out if this couple was connected to my tree or not because of how common names are and the different practices for choosing surnames. Sometimes the simplest of records provide the most details. This brief death record gave me enough information to connect these people to my tree. It also told me a little about this moment in their lives, which should have been their happiest, but turned into a tragedy.